UTG Shadow OPS Sniper Airsoft Rifle | BUDK.com - Knives & Swords At The Lowest Prices! Scan the field from a secure position behind this Airsoft Shadow OPS Sniper Rifle. 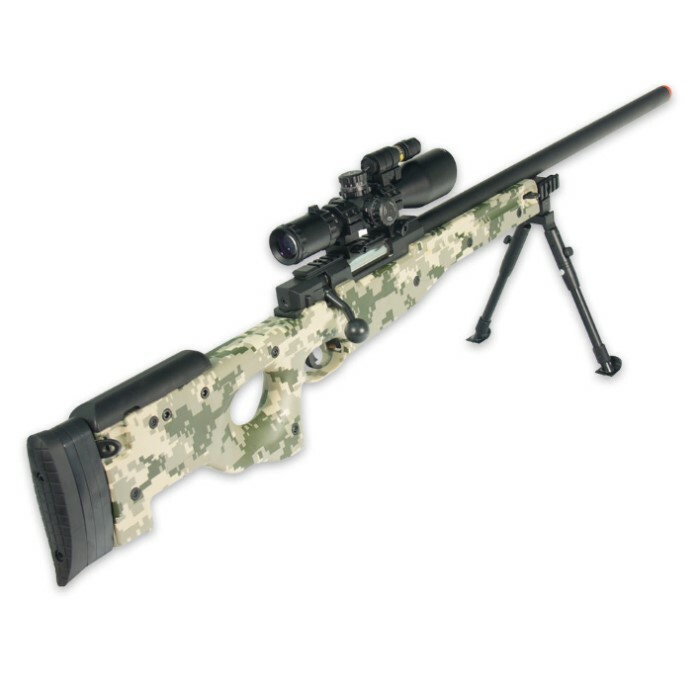 This detailed replica features a one piece precision metal barrel, adjustable hop-up system, high power pin-point accuracy system, and highly effective long-range shooting capability. I ordered this product not to long ago and never received it. I called Customer Service only to find out that not just the gun in 'Olive Drab' but the entire PRODUCT has been discontinued. I am rating this one star only because they never told me that it was discontinued. This gun is great! extremely accurate to about 150-170 feet with a scope. It is a good sniper, but it could use a scope. Is is a strong air gun. First off, I have the $700 dollar version of this and I have used it in many simulations. For the price of this rifle it is GREAT!!!!!!!!! Just get a good scope for it and your ready to roll. The accuracy lacks after about 70meters but you can nail anything before that range. And even then if you use High Density bb's (like .25+ grams) it goes too 100 meters accurately. Trust me. If you didn't get a good one then it was a manufacturer defect, send it back and get a new one. THESE ARE GREATTTTT!!!!!!! I received this rifle just yesterday and was extremely excited, but when I opened it, it wasn't as epic as I had expected. It is still a nice bolt action airsoft rifle but for the price I expected more.